Ivory carried the ball six times for 34 yards while catching one of two targets for 11 yards in Monday's loss to the Patriots. Analysis: Ivory actually looked better than LeSean McCoy, who did most of his damage in the passing game but was held to just 13 yards on 12 rushes. Ivory also ran the ball well in the Week 7 loss to the Colts with 81 yards on 16 carries. That said, McCoy is still the bell-cow back in Buffalo, and that will remain the case unless Shady gets dealt at Tuesday's trade deadline, a likelihood that seems to be slipping by the hour. Analysis: Nothing is ever guaranteed when it comes to concussions, but given the opponent and the fact that Ivory is expected to take a back seat to Shady for the game, it'd be a big risk to have Ivory in your lineup at the time of lineup lock and assume he's in for a night of high volume. Ivory (hamstring) has been cleared to play in Monday's game against the Patriots, Matthew Fairburn of The Athletic reports. Ivory (hamstring) was a limited practice participant Friday. 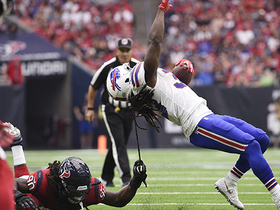 Ivory (hamstring) was limited for the team's first practice of the week Thursday, Mike Rodak of ESPN.com reports. 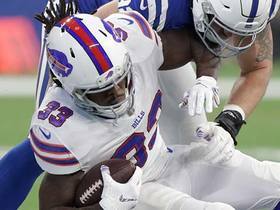 Analysis: Ivory downplayed the injury following his biggest game of the season in Sunday's loss to the Colts, where he racked up 106 scrimmage yards following the early departure of starter LeSean McCoy. We'll assume Ivory will be ready for Monday's contest against the Patriots, but his weekly value has already taken two hits -- one being that he's apparently not 100 percent, the other that McCoy is almost through the concussion protocol. 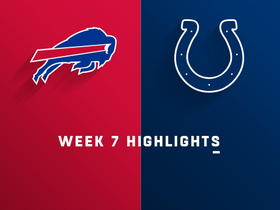 Ivory indicated that the unspecified injury which briefly sidelined him during Sunday's 37-5 loss to the Colts isn't major, Mike Rodak of ESPN.com reports. 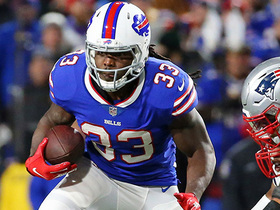 Analysis: Rodak suggests that Ivory may be dealing with a lower left leg issue, but either way, the running back's status gains added import with LeSean McCoy having been forced out of the contest with a concussion. Despite the lopsided score, Ivory still managed to log 16 carries for 81 yards and catch three passes for 25 yards Sunday in relief of McCoy, who was limited to just two carries. Ivory rushed 16 times for 81 yards and caught three of six targets for 25 yards in Sunday's 37-5 loss to the Colts. 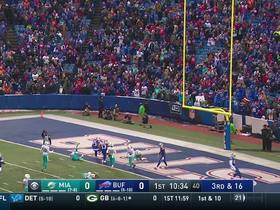 Analysis: LeSean McCoy left the game early with a head injury after banging his helmet on the ground, opening up the majority of rushing work to Ivory. Unfortunately for Ivory, Buffalo's running back situation is one of the least desirable in the league, as scoring opportunities have come few and far between for an offense currently led by journeyman Derek Anderson under center. If McCoy's unable to suit up against the Patriots in Week 8, Ivory's expected volume could give him some value. Ivory had six carries for five yards and caught his only target for four yards in Sunday's loss to the Texans. Ivory rushed 14 times for 43 yards and wasn't targeted in the passing game during Sunday's 13-12 win over the Titans. 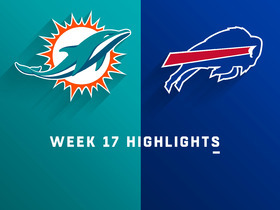 Analysis: Buffalo scored on its first possession and controlled the clock on the ground, giving Ivory 14 carries and LeSean McCoy 24. The Bills will likely try a similar formula against the Texans in Week 6, but McCoy should get the bulk of the touches either way, leaving Ivory with a limited role. Ivory rushed six times for 15 yards and wasn't targeted in the passing game during Sunday's 22-0 loss to Green Bay. Analysis: Ivory actually got more carries than the returning LeSean McCoy (five rushes for 24 yards), but neither made much of an impact on a dismal day for the Bills offense. 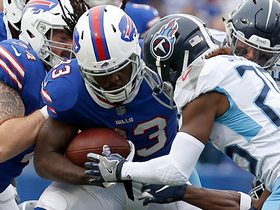 McCoy appeared to be battling an injury to his left hand after the game, and his potential absence could reopen more looks for Ivory against the Titans in Week 5. Ivory is in line to return to a backup role in Week 4 with LeSean McCoy (ribs) listed as active and starting for the matchup against Green Bay. Analysis: Ivory carried the ball 20 times in Week 3 when McCoy was inactive, but he could see his workload decrease significantly if McCoy is able to play through ribs discomfort and take on the majority of the snap share. Should McCoy suffer any type of setback, or simply need a breather, Ivory would be the default backup option at running back. Backfield mate Marcus Murphy, who was Ivory's backup in Week 3, is inactive for the contest due to a rib injury of his own. Ivory's teammate LeSean McCoy (ribs), who practiced on a limited basis for a third straight day Friday, is listed as questionable for Sunday's game in Green Bay, the Bills' official site reports. 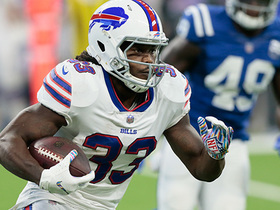 Analysis: Ivory put up 116 yards from scrimmage in McCoy's absence last week, so he'd have value once again if Shady can't go when he tests himself Sunday morning before the game. We tend to think McCoy is a lot closer than he was last week when he almost suited up against Minnesota, though if he does get sidelined again Ivory would be the primary weapon -- Marcus Murphy would get some work as well -- against a Green Bay defense that's giving up an average of 387 yards per game. 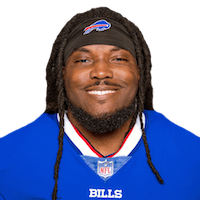 Ivory could return to a backup role Sunday against the Packers after teammate LeSean McCoy (ribs) said he intends to play in the Week 4 contest. Analysis: Ivory took advantage of McCoy's absence in last weekend's 27-6 upset win over the Vikings, gaining 56 yards on 20 carries and 70 yards on three receptions. The big performance could earn Ivory more work going forward, but it's hard to see how he would regular reach double-digit touches unless McCoy is limited by the injury. Ivory had just five carries for 10 yards and one catch for 30 yards through the first two weeks of the season. Ivory carried 20 times for 56 yards and caught three of four targets for an additional 70 yards during Sunday's 27-6 win over the Vikings. 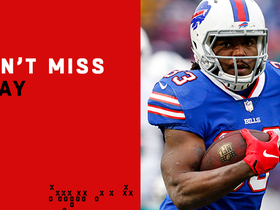 Ivory will draw the start at running back with LeSean McCoy (ribs) inactive, Mike Rodak of ESPN.com reports. Analysis: Ivory is still dealing with Marcus Murphy for scraps behind LeSean McCoy, though the bigger news for both reserves is that McCoy suffered a rib injury during the game and reportedly didn't look too good in the locker room after the game. Settling into No. 3 role? Ivory had just three carries carries for three yards and didn't touch the ball in the passing game during Sunday's blowout loss to the Ravens. Analysis: LeSean McCoy is the bell cow back in Buffalo, but due to his 30-year-old body and the thought the Bills might protect him on short-yardage work, there's value in deeper leagues in owning the No. 2. That job looks like it's been won by Marcus Murphy, however, who rushed six times for 31 yards and saw 23 offensive snaps to Ivory's mere seven. Ivory still could be used around the goal line, but for now Murphy's the better option for touches. Ivory rushed three times for 31 yards and wasn't targeted during Sunday's 26-13 preseason loss to the Bengals. Analysis: Ivory pushed the pile for an eight-yard carry on his first touch and later added a 20-yard run. The bruising veteran's hard-running style makes him a great change-of-pace option, but Ivory has proven to be injury-prone when given a greater workload. Should LeSean McCoy's hip/groin issue or legal troubles keep him out of games, Ivory would likely split work with a rising Marcus Murphy, who had 11 carries for 58 yards in this one. Ivory had two carries for six yards in Friday's preseason game in Cleveland. Analysis: LeSean McCoy dominated first-team work before giving way to a mixture of Ivory and Marcus Murphy, the latter of whom had four carries for 39 yards. Ivory's contract would seem to make him a lock for a roster spot, but ESPN.com's Mike Rodak suggests Murphy has a real shot to push for the No. 2 running back job. It'll be something to watch for over the next couple weeks, with Travaris Cadet potentially also in the mix for backup work. Ivory agreed to terms on a two-year contract with the Bills on Tuesday. Ivory was released by the Jaguars on Friday, Field Yates of ESPN reports. Ivory (coach's decision) is inactive for Sunday's AFC championship game at New England, Mike Kaye of FirstCoastNews.com reports. Analysis: Unavailable for each of the Jags' three playoff games to date, Ivory will again don street clothes as Leonard Fournette and T.J. Yeldon handle the bulk of the RB reps Sunday. Ivory is inactive for Sunday's playoff game against the Steelers. Analysis: With Ivory a healthy scratch, T.J. Yeldon and Corey Grant are on hand to back up top running back Leonard Fournette. Ivory was a healthy scratch for the Jaguars' Week 17 matchup with Tennessee. Ivory (back/elbow) does not carry an injury designation for Sunday's game against the 49ers. Analysis: Ivory will be available for the contest, but with top back Leonard Fournette (quadriceps) slated to return to action Sunday, Ivory -- who logged 17 carries for 42 yards in Week 15 -- is in line to serve in a complementary role in the Jaguars' backfield this weekend, along with T.J. Yeldon and Corey Grant. Ivory (back/elbow) was a limited participant in Thursday's practice. Analysis: Ivory has been limited in the Jaguars' first two practices of the week, but the team may just be easing up on him after he played 31 snaps -- his highest total in six games -- during Sunday's 45-7 win over the Texans. The veteran started that contest in place of an injured Leonard Fournette (quadriceps), but with the rookie on track to play Week 16 against the 49ers, Ivory's carry total should dip back into the single digits. Ivory (back/elbow) was limited at practice Wednesday. Analysis: With Leonard Fournette (quadriceps) sidelined in Week 15, Ivory started at running back and logged 17 carries for 42 yards in the Jaguars' 45-7 win over the Texans, though he failed to convert his two goal-line totes into touchdowns. Fournette practiced fully Wednesday and is on track to play Sunday against the 49ers, so Ivory appears poised to return to a complementary role in the team's backfield, assuming he's able to play through the back and elbow issues. Ivory carried 17 times for 42 yards in Sunday's 45-7 win over the Texans. Ivory is expected to start in place of Leonard Fournette (quad) in Sunday's game against the Texans, John Oehser of the Jaguars' official site reports. Analysis: T.J. Yeldon is also in line to factor in Sunday and Corey Grant is on hand as well, but look for Ivory, who logged a total of 37 carries for 117 yards and TD over the two games Fournette missed previously this season, to head the team's running attack in Week 15. Meanwhile, Yeldon could potentially see enough complementary touches out of the backfield to merit attention for those scrambling to fill a void at running back. Ivory is expected to start Sunday versus the Texans with Leonard Fournette (quadriceps) unlikely to play, Ian Rapoport of NFL Network reports. Ivory ran for 48 yards on six carries during Sunday's 30-24 win over Seattle. Analysis: Ivory's total yards marked his highest total since Week 9. The uptick might look like progress, but 34 of them came on an early first-quarter run. Overall, the veteran back saw the field for just 12 of 66 offensive snaps, eight more than fellow backup T.J. Yeldon, but a whopping 38 less than starter Leonard Fournette. Ivory hasn't seen double-digit touches since Week 9 and isn't a reliable fantasy start. Ivory ran the ball four times for 12 yards and added a three-yard catch during Sunday's 30-10 win over the Colts. Analysis: The return of Leonard Fournette has not been kind to Ivory. Ivory averaged 20 touches per game during Fournette's two-game absence in Weeks 7 and 9 and averaged 9.3 touches in the six games prior with Fournette in the lineup. Since Fournette has returned, however, Ivory has just 18 total yards on 14 touches in four games. He inched past fellow backup T.J. Yeldon in offensive snaps Sunday nine to six but generally should be discarded from a fantasy perspective at this point. Ivory lost a fumble on his only carry in Sunday's 27-24 loss to the Cardinals. Analysis: Ivory was held to six carries for six yards the previous week while battling an illness in a 19-7 win over the Browns. With Leonard Fournette is locked in as the lead runner and T.J. Yeldon doing solid work on passing downs, Ivory might find himself on the inactive list for Week 13 against the Colts. Ivory carried six times for six yards in Sunday's 19-7 win over the Browns. Ivory could see limited snaps Sunday against the Browns, as he's battling an illness, per Ian Rapoport of NFL Network. Analysis: On the plus side, fellow RB Leonard Fournette is active for the contest despite dealing with an ankle injury. Ivory is in uniform Sunday, but based on Rapoport's report, he's under the weather and may be limited. Meanwhile, T.J. Yeldon is healthy and on hand to provide support for Fournette. Ivory carried the ball once for a one-yard gain in Sunday's 20-17 win over the Chargers. He also lost five yards on a lone reception. Ivory carried the ball 20 times for 69 yards and added 34 yards on three catches in Sunday's 23-7 win over Cincinnati. Ivory will start at running back Sunday against the Bengals after Leonard Fournette (coach's decision) was made inactive for the contest, Adam Schefter of ESPN reports.